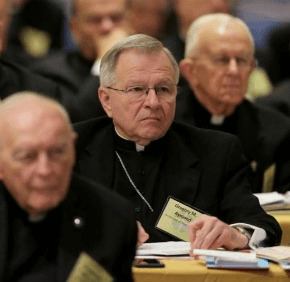 ST. LOUIS – A few hours before the U.S. bishops’ spring general assembly opened June 10 in St. Louis, the meeting already had begun. Tweets were trickling out from bishops, media and observers, using the hashtag #usccb15. Among their first items to share: a link to the live stream of the proceedings, bishops making their presence known and media types encouraging followers to watch their live coverage. Approximately 250 bishops attended the June 10-12 assembly at the Hyatt Regency Hotel in downtown St. Louis. Topics for discussion in the three-day meeting included a progress report on combating the issue of sexual abuse of minors by clergy; the forthcoming papal encyclical on human ecology and the environment; Pope Francis’ visit to the United States and the Synod of Bishops this fall; and an update on the promotion and defense of marriage as well as on ongoing communications efforts. In a nod to the bishops’ presence in St. Louis and the unrest in nearby Ferguson and in Baltimore, where the bishops meet each November, Archbishop Joseph E. Kurtz of Louisville, Kentucky, president of the U.S. Conference of Catholic Bishops, made a statement on race relations, which included several concrete steps to promote peace, justice and respect for all people. Surveying the sea of bishops, the use of laptops, iPads and cellphones was apparent. Tweeting, texting and emailing made a seamless integration into the normal proceedings of business. It was a reflection of how communications technology continues to “evolve at a dizzying rate,” said Archbishop John C. Wester of Santa Fe, New Mexico, who gave a presentation on communications as head of the bishops’ Committee on Communications. Archbishop Wester announced a new Catholic Church app, which the U.S. Conference of Catholic Bishops is expected to release in mid-July and appeal to the ever-increasing number of people accessing information from a mobile platform. Forty percent of traffic to the bishops’ website, usccb.org, is from mobile devices, according to Archbishop Wester. Available for iOS and Android formats, the free app will include a parish finder, news and more. Archbishop Wester recalled an encounter he had about eight or nine years ago with Father Daniel Dorsey, uncle of Twitter co-founder and St. Louis native Jack Dorsey. Father Dorsey was on his phone, messaging with his nephew about the bowl of Cheerios he was eating. “Tell your nephew he’s wasting his time,” Archbishop Wester told the priest. A few years later, he ran into Father Dorsey, after Twitter became a wild success. “I guess I was wrong,” Archbishop Wester joked. The rapid pace in which information is shared through social media helped bishops who attended an afternoon news conference. A reporter asked about the Vatican’s announcement that morning of a new tribunal to handle cases of bishops accused of not protecting children against abusive priests. Bishop Christopher J. Coyne of Burlington, Vermont, was sitting in the bishops’ morning session when someone tweeted him a link to the announcement, and he responded with knowledge of the breaking news. According to Matt Palmer, the USCCB’s social media coordinator since 2012 and former social media coordinator for the Catholic Review in Baltimore, the number of bishops on Twitter has increased, especially in the last few years. He estimated about 40 bishops have personal accounts. That presence fluctuates on Facebook, he said. The USCCB has a presence on Twitter, Facebook and Instagram. Palmer also used Periscope, a live-streaming app through Twitter, to broadcast the media conference. It drew about 150 followers.